BOXING LEDGER | LATEST BOXING BLOGS | BOXING ARTICLES | BOXING BLOG FIGHT: "The Big Challenge"
Can the distinguished Polish pugilist cope with the giant’s incredible height and reach advantage? 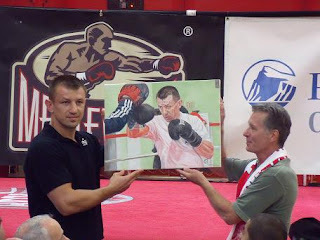 On Saturday, August 21st, 33-year-old Tomasz “Goral” Adamek (41-1, 27 KO’s) defends his IBF International Heavyweight and WBO/NABO Heavyweight titles against 37-year-old Michael Grant (46-3, 34 KO’s) in a riveting heavyweight showdown. Adamek, who now resides in Jersey City, New Jersey by way of Zywiec, Poland, will make his 5th appearance at the Prudential Center. He has won ten straight bouts, and is looking to extend his successful winning streak in front of an always energetic crowd at the Prudential Center, where countless Polish fans gather to support their hero. Adamek will attempt to exploit the chin of Grant, who has been stopped in all three of his professional losses. 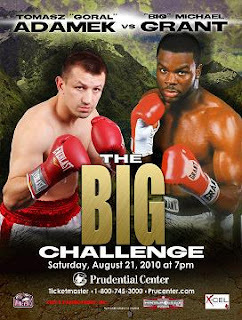 Previously, Adamek won a tough 12-round majority decision versus a durable Chris “The Nightmare” Arreola. Beforehand, Adamek cruised to wins in the heavyweight division against Andrew Golota (TKO 5) and Jason Estrada (W 12). Earlier, Adamek won the vacant WBC Light Heavyweight Championship from Paul Briggs (MD 12), as well as the IBF Cruiserweight Championship, overthrowing Steve “USS” Cunningham (SD 12). Will an Adamek victory pave the way for a clash with David Haye, Vitali Klitschko or Wladimir Klitschko on HBO in the near future? Michael Grant was not in attendance today, as he is training in Las Vegas, Nevada with Eddie Mustafa Muhammad for the confrontation ahead. Since losing by a seventh round stoppage against Dominick Guinn in 2003, Grant has not been defeated, earning 15 wins in his last 16 fights, including 8 straight victories. Most recently, Grant stopped Kevin Burnett in the first round on May 7, 2010. Prior to that, Grant had not fought since late in 2008. A victory over Adamek would springboard Grant into the mix among the elite heavyweights. In junior middleweight action, Joel Julio (35-4, 31 KO’s) squares off against Jamaal Davis (12-6, 6 KO’s) in a ten-rounder. Julio looks to rebound after suffering an 11th round knockout loss to Alfredo Angulo in his last bout. Tyrone Lucky makes his professional debut in a four-round lightweight bout versus Joal Aliacon (0-1, 0 KO’s). 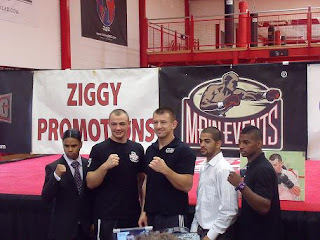 Aliacon lost his 1st professional bout by a four-round unanimous decision. Brooklyn’s Sadam Ali (8-0, 4 KO’s) will be featured in a six-round welterweight bout. Ali is coming off an impressive third round stoppage of Julius Edmonds on ESPN2 “Friday Night Fights”. Paterson’s Jeremy Bryan (13-1, 6 KO’s) returns to action in a six-round junior welterweight match-up. In his last outing, Bryan was kayoed in the eighth round by Vincent Arroyo in Atlantic City, New Jersey on the undercard of Kelly Pavlik-Sergio Martinez. Heavyweight Adam Kownacki (4-0, 4 KO’s) attempts to win his fifth consecutive fight by knockout in a scheduled four-rounder. Also, lightweight Shemuel Pagan makes his professional debut in a scheduled four-rounder. As an amateur, Pagan won 5 New York Daily News Golden Gloves Championships in 3 different weight classes.